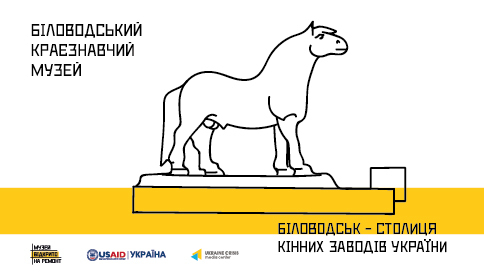 The project “Bilovodsk is Ukraine’s horse farming capital” will be presented at the Bilovodsk district-level local history museum (Bilovodsk town, Tsentralna str. 154) on February 15 at 11:00. The project is organized by Ukraine Crisis Media Center in the framework of the project “Under construction: Museum open III” supported by the United States Agency for International Development (USAID). The area of Bilovodsk (Luhansk region) owes its unique cultural heritage to Ukraine’s oldest horse farms, five in total. The Derkulskyi horse farm recently marked its 250thanniversary. It has played a key role in establishing Bilovodsk an administrative center at local level. Today it holds much of the social and economic potential. The Derkulskyi horse farmis the oldest horse farm in Ukraine. It received its first horses – German, Danish, Spanish, Persian and English ones in 1767. In the late 19thcentury the horse farm started breeding purebred horses. In 1906 a horse of the Derkulskyi farm was sent to England for the first time to take part in a race and actually won one. After World War II the horse farm bred many racing horses of internationally-recognized class rating. One of the horses won three most important races in the Soviet Union and got the title of the “three-time crowned”. Horses of the Novooleksandrivskyi horse farm won first places in top-level races in the USSR 26 times. A monument to a horse of the Novooleksandrivskyi horse farm designed by sculptor Mozhayev and architect Zhytomyrskyi was installed at the entrance to the farm in 1975. The Novospasivskyi horse farm(no.87) was established in 1932 based on former capacities of Derkulskyi and Lymarivskyi horse farms in the villages of Novospasivka and Pluhatar. In 1954 the horse farm was reorganized into “radgosp” – a state-owned farm producing meat and milk. The Striletskyi horse farm started breeding thoroughbred horses in 1920s. In 1924 the farm (also called “Striltsivka”) became one of the leading horse farms. In 1926 the farm bred a horse that became the first-ever “three-time crowned” one on the Soviet scale. Project curators: DE NE DE artistic initiative. Participants: Leonid Marushchak, head of the project “Under construction: Museum open”; Oleksiy Bykov, modernism researcher; staff of Bilovodsk district-level local history museum: Hennadiy Vereskun, director; Oksana Balbukh, researcher and Natalia Rukavitsyna, collection manager. Volodymyr Stepanov, expert in local history; Svitlana Svystula, director of the Novooleksandrivskyi horse farm museum; Volodymyr Svystula, awarded trainer; Serhiy Gladkov, director of the Derkulskyi horse farm. The exhibition is open from February 15 till March 15, 2019. Press contact (Bilovodsk): Hennadiy Vereskun, museum director (+38 066 760 47 13) and Olha Honchar, PR consultant at the “Under construction: Museum open” project (+38 093 339 76 46).